I never wanted to be a server in a restaurant. When I was 20 I applied for and received a job as a hostess in a family restaurant. At the time I just wanted some spending money while I went to college in the same small town and this restaurant was less than two miles from my apartment. I spent one year working in the restaurant and then moved on, figuring my stint in the restaurant business was over. Fast forward to six years later. I'd lost my job and had another job with very little hours. I needed a job close to my home (in the same small town) where I could make decent money. After looking over my options I went back to the restaurant from my early 20's and was given a job on the spot - only this time I would be a server and not a hostess. Anyone who thinks that waiting tables is easy money probably hasn't actually done the job before. It's hard work. In the five years that I worked in that restaurant I worked my tail off, having to constantly multi-task, pushing my body past its limits, coming home totally exhausted from a long shift. It taught me some valuable lessons that I know I'll take with me through my entire life and today I'm going to share a few of those lessons with you. This goes both ways. I found that the happier I was the nicer MOST people were. I say most because sometimes people just aren't nice. Unfortunately after 5 years of waiting tables I ran into people who weren't happier no matter what I did. Being a server taught me that some people just aren't happy. It has nothing to do with you and everything to do with them. Does that make it any easier when you work hard and get stiffed? Not really. It's a hard lesson to learn. I've always been a decent tipper but working in a restaurant has taught me to appreciate others who work in the service industry. 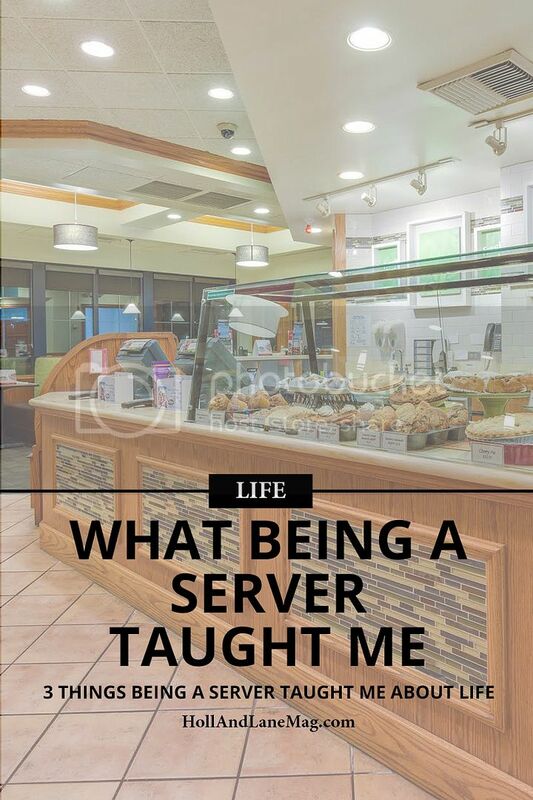 I'm sure everyone has a story about being at a restaurant and having a less than stellar server. But think about it - when is the last time you had a bad day at work? What if you're bad day hurt how you paid your bills? I'm not saying it's okay for the person serving your food to be a jerk. But I try to keep that in mind if I have a server who seems off. And unless it's clear that they simply don't care I make sure to tip them well. Who knows, maybe that good tip is enough to turn their day around? Maybe it's the difference that they need in their life. And hey, it's good karma for me. The number one thing I took away from working in a restaurant is the relationships I developed. Those regulars whose faces and conversations lit me up and made my day. In my five years of waiting tables I met customers who I now call friends, people I make sure to see even now when I don't wait tables anymore. Have a restaurant you go to often? Start up a conversation with the server who's always there. You never know what may develop from that first conversation. For five years serving was a big part of my life and those lessons will never fade away.